This week I want to encourage you with a word on barrenness. I am going to read a verse of Scripture from 1 Samuel 1 in the Message translation. But her rival wife taunted her cruelly, rubbing it in and never letting her forget that God had not given her children. This went on year after year. Every time she went to the sanctuary of God she could expect to be taunted. Hannah was reduced to tears and had no appetite. It says that this went on year after year. How many times? Every time she went to the sanctuary she could expect to be taunted. I want to share the difference of how it says it in the New Living Translation. And though he loved Hannah, he would give her only one choice portion because the Lord had given her no children. So Peninnah would taunt Hannah and make fun of her because the Lord had kept her from having children. Year after year it was the same—Peninnah would taunt Hannah as they went to the Tabernacle. Each time, Hannah would be reduced to tears and would not even eat. (1 Samuel 1:5-7). It says that the Lord had given Hannah no children. Her womb was closed. This was a chronic issue. 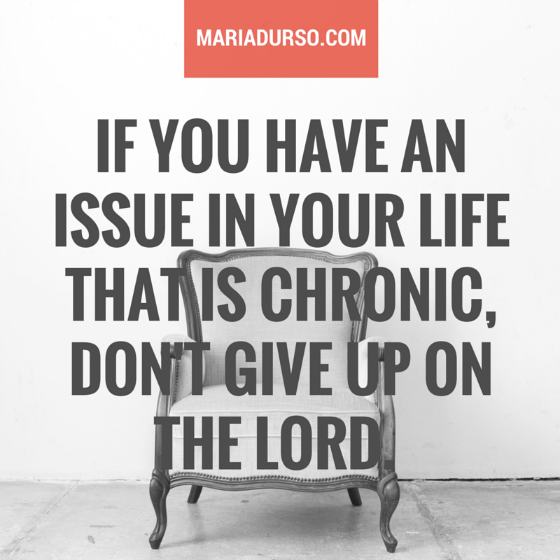 I am here to tell you to tell you today that if you have an issue in your life that is chronic, don’t give up on the Lord! No matter how long you are going through something, weeping endures for the night but joy comes in the morning. It says this went on year after year whenever Hannah went up to the house of the Lord. Her rival provoked her until she wept and could not eat. A little background about this wonderful woman of God named Hannah. Hannah was a woman who loved the Lord with her whole heart. And even though God did not give her any children, Hannah was still faithful to God. Question: Are you currently experiencing a chronic issue(s) in your life? What is one way you can remain faithful to the Lord in this season?